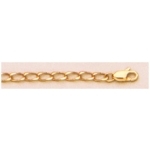 a21686 14kt Yellow Gold Open Curb Chain 20" Neckchain. Types of Clasps May Vary from Illustrations. "20"" Neckchain. Types of Clasps May Vary from Illustrations."